Kay (Doris Kathleen Michaels) Barnard of Wild Rose, WI, formerly of Menomonie, WI died August 19, 2018 at 1:00 am peacefully at her computer. She was born on a farm near West Salem in Kenosha County on October 2, 1920 to Alexander Otto and Daisy Vera (Loesel) Michaels. Bovine TB in the dairy herd forced her father's employer to "let his help go" and the family moved back to Cochrane, WI (Buffalo County) where her grandparents Carl (Charles) and Lydia (Herold) Michaels lived. Her father Alex worked odd jobs for several years before finally becoming a Standard Oil distributor. He then moved to Alma to sell the same products. In September of 1929 they bought a small farm in Lees Valley near Gilmanton and farmed there until 1937. While on the farm Kay first owned a Shetland and then a Welsh pony. In 1937, Kay entered the La Crosse State Teachers College. She transferred to The Stout Institute in Menomonie in 1938 and graduated in 1941. Her first teaching job was in Cooks, Michigan. She taught chemistry, biology, home economics, girls physical education (including interscholastic basketball) and was adviser to the junior class. Kay and David Putnam Barnard were married May 28, 1941. They spent the WWII years in Kenosha and Milwaukee where he was the Navy Bureau of Aeronautics Representative at the Seaman Body plant for Nash-Kelvinator. Carolyn, their oldest daughter, was born October 8, 1944 in Milwaukee. Three other children, Nancy (1948), Charles (1954) and Kent (1957) were born in Menomonie. They returned to Menomonie in 1945 where Dave taught at the college and finished his BS and MS degrees at Stout. They spent a year and three summers in Bloomington, Indiana where Dave worked on an EdD while Kay taught home economics in the nearby town of Solsberry. From 1965 to 1968 Kay enjoyed working as a Welcome Wagon Hostess. In 1968 she finished an MS degree at UW-Stout and taught 7th and 8th grade Earth Science at the Menomonie Junior High until 1982. When Kay retired she audited art classes at UW-Stout. For several years she exhibited at various craft shows. Furthermore, during these years she was a member of the Board of the Wisconsin Regional Art Association. This is a private non-profit art association dedicated to bringing art to rural areas. Kay enjoyed working on her family genealogy. She and two cousins wrote a book about the descendants of their great grandfather Jacob Herold. She helped form the Dunn County Genealogical Society as well. During the years between raising four children, doing the family sewing, house maintenance, gardening, cooking, and cleaning; Kay found time to be a Senior Girl Scout Leader, Leader Trainer, and Neighborhood Chairman for the Girl Scouts. When her sons grew up she became a Cub Scout Den Mother for three years. As a Methodist she was advisor for the Methodist Youth Group for several years, worked in circle activities, was active in the Sunday School, and was chair of the Methodist Bazaar for five years. Additionally, she was a member of the Menomonie Recreation Committee for several years. Kay helped start the League of Women Voters of Dunn County and the Friends of the Menomonie Public Library. She was President of various organizations including the AAUW and Stout Faculty Wives. The position Kay found most aggravating, yet rewarding, was being President of the Menomonie Public Library Board from October 1976 to July 1984. “Building a Public Library” was controversial, but the board managed to build the lovely library building — designed by John Howe, a disciple of Frank Lloyd Wright — on the shore of Lake Menomin. Kay was Chair of the Unitarian Universalist Society of Menomonie from September 2002 to May 2005. In June of 2006 Kay and Dave moved to the Jefferson Residential Apartments in Middleton, WI. She then happily retired from cooking, cleaning, gardening and other household chores. There she was Chair of the Resident’s Staff Appreciation Committee for five years. In June 2011 they downsized again and moved to Pewaukee to be closer to family members. After Dave’s passing in June of 2014, Kay moved to Wild Rose for a change in scenery and to be closer to family members. In Wild Rose she continued to be efficacious and a vital part of the community. She joined Kiwanis, the Wild Rose Historical Society and the Friends of the Library. 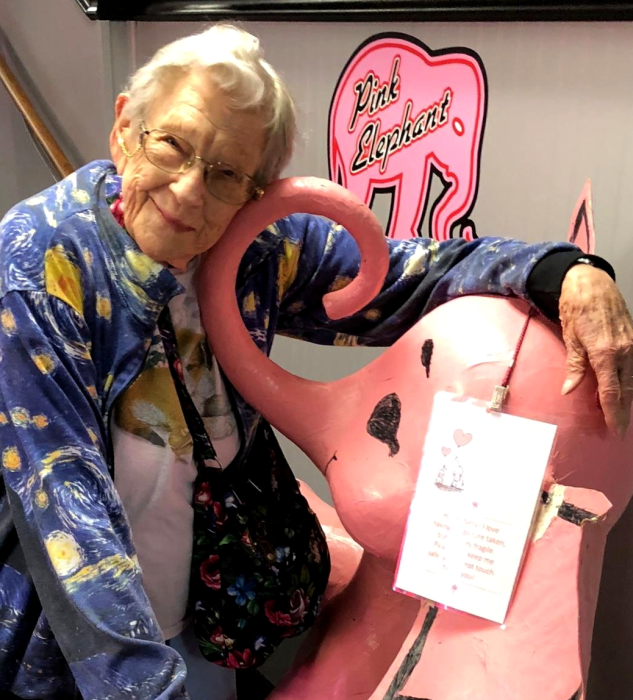 She was the Founder of Patterson Memorial Library’s knitting group called the Knit Wits, Chair of the Library Landscaping Committee and Secretary of the Master Gardeners. Kay was preceded in death by her husband, David, her parents and her daughter Carolyn Ann Barnard (Bruce Hemingway). Kay is survived by one daughter, Pastor Nancy (Craig) Carmichael-Stoner of Dousman; two sons, Charles Barnard of Menomonie, and Kent (Erin) Barnard of Wild Rose; four grandchildren, Suzanne (Douglas) Atkins of Converse, TX; Lee (Nicole) Carmichael of Waukesha; Alexander Barnard of Bellevue, KY; and Kate Barnard of Cincinnati, OH; and two great grandchildren, Oliver and Mercer Carmichael-Grandstrand of Waukesha. An intimate memorial for those that live there will be held at Rosemore Village. Funeral services for the public will be held at 1 p.m. Sunday, August 26, 2018 at the Maple Crest Funeral Home in Waupaca. A memorial service will be held at 1 p.m. Friday, September 28, 2018 at the Holtby Museum at Wakanda Park, 2006 Wakanda St. NE, Menomonie, WI. Visitation will be held from 12 p.m. until the time of service. Cremation has occurred and burial will be at the family plot in the Evergreen Cemetery in Menomonie, WI. Online condolences may be expressed at www.maplecrestfuneralhome.com. In lieu of flowers, Kay prefers memorials to Stepping Stones of Menomonie, Menomonie Humane Society, the Waushara Food Pantry, or your favorite food pantry or humane society.